Report from the Medicine Hat Food Bank and launch of the Sunrise Rotary Rise 'n Shine free coffee! We had a great time this morning at Madhatter Coffee Roastery in downtown Medicine Hat! This week we were led on a photographic tour of Keith and Ted's most excellent adventures through Australia and New Zealand. Crosswalks for the aged. Fantastic beaches. Glorious greenery. Namesake beer and wine. And apparently a couple of men who drive better on the left side of the road (as per their wives). Thanks for taking us there by photos! We are proud to support Danielle Skogen in her efforts with the SERnina project which provides re-usable menstrual products to school-aged girls in Guatemala. With the $1000 cheque presented by Syl, the support we provided, helps girls continue their education and enhance future opportunities. Danielle also reports that a local business owned and operated by women will be producing these products. A win-win! Thanks to Sharla for organizing this great initiative. 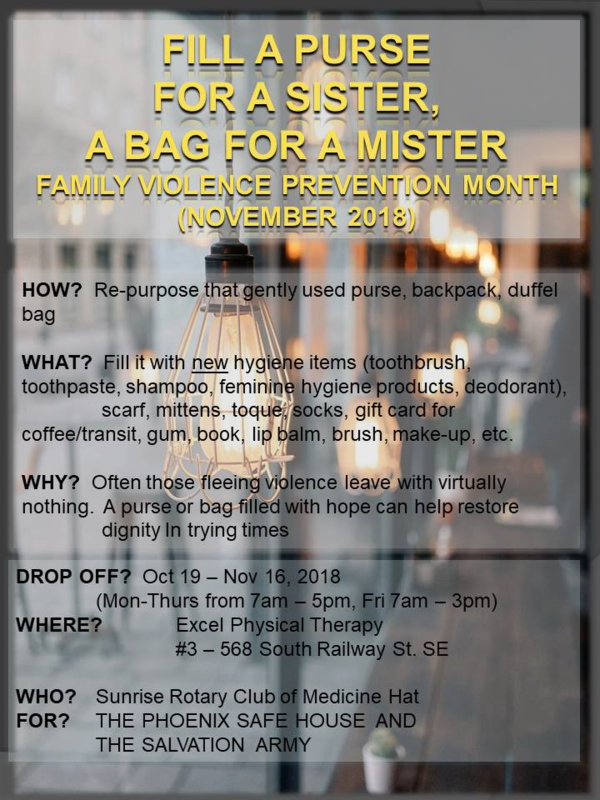 The response was overwhelming with Medicine Hat Stepping up to donate 170 bags/purses bursting with necessities for the Women's Shelter and Salvation Army. This is what we did! Thank you for your support with the Purse for a Sister, Bag for a Mister project, 170 purses and bags for the Phoenix Safe House and Salvation Army. Speech & Language Works is a speech and language pathology firm in Medicine Hat, Alberta. Their client-centered team works with children and adults presenting a wide range of speech and language issues. Thanks to Sandy Redden for hosting us at her office and sharing her passion for what she does. On Tuesday Owen Shuck presented to our club on his experiences of being a camper at the Rotary Alberta Youth Entrepreneur Camp (RAYEC) this summer. Our esteemed District Governor Dan Doherty stopped at our club in his beautiful Rotary RV. Sunrise Rotarians met at MH Brew Co. for some great food and a pint (or two) to support our international efforts to eradicate Polio. A great day for a wonderful Sunrise Rotary MHC Trail walk and induction of our newest Rotarian, Chris Shorrock! Welcome Chris! This year the lucky recipients of the $15 000 draw are Alfred and Doreen Kohls! Treasurer Bill Cooper presents a $500 cheque to Karen LeHay of the Medicine Hat Pride Association. Karen spoke to our Rotary club regarding the Pride Festival being held in Medicine Hat on September 15, 2018 and current initiatives being addressed by the Pride Association. A big thank you to Craig and Donna for hosting a great evening of fun and fellowship for Sunrise Rotary. Great presentation by Bill Fitzsimmons of the Calgary West Rotary Club on Rotary's amazing microcredit and clean water projects in Honduras. A recent pic of Raffle Co Chair Ted and Club President Les presenting this year's Raffle $15,000 Jackpot prize to Winner Susan Townend of Medicine Hat - Smiles all around! With special thanks to Les for organizing and Josh acting as Host, our Sunrise Rotary Family celebrated this past Thursday with excellent Food, Fun & Fellowship at the MH Brewing Co! With thanks to Community Futures Entre - Corp, His Worship the Mayor of the City of Medicine Hat Ted Clugston addressed a good crowd earlier today at the 15th Annual Mayor's Breakfast. Pictured is Dan Frost (CF Board Member and MC) along with Mayor Clugston. There was BACON and POETRY all celebrating small business during national Small Business Week in Canada. Joined by Past President Keith and fellow Rotarians Clare and Bonnie, it was our pleasure to present recently retired Rotarian Bill Lloyd with an Honorary Lifetime Membership Award from the Rotary Club of Medicine Hat Sunrise. The Award recognizes the highest distinction that the Sunrise Rotary Club may bestow to individuals who has contributed meritorious service in the furtherance of the Club and Rotary’s ideals and for the permanent support of Rotary causes. At the same time, it was an honor to also present Bill with the Paul Harris Fellow Award on behalf of the Rotary Foundation in appreciation of the tangible and significant assistance Bill has been to Rotary! It was time well spent with Bill and Fay and we wish them well in all their future endeavours! Sunrise Rotary Stampede Raffle $15,000 Jackpot Winner Evelyn Cummins receives her Grand Prize from Raffle Co Chair Ted Rodych and Club President Dan Kammerer. Through the ongoing wonderful support of our community, the generous help from the Family and Friends of Rotary and the tireless efforts of Rotarians, the 2016 Raffle was another unqualified success - well done everyone! Our Guest today was James Smith, President, Prairie Gleaners Society - James provided the following definition - Glean: to pick up and gather what is left behind. Prairies Gleaners was established in 2009, but was inspired 18 yrs ago by the hunger and need of a Rwandan boy. Following Keith’s retirement (File Photo), he and Val were initially on their way to either Arizona or Hawaii, until Keith saw an advertisement for a trip to Iceland. $750 per person covered the flight and 5 nights accommodation and seemed to good to pass up! They decided to go to Iceland instead. The 2016 District 5360 Conference "Rising to New Heights" was held in picturesque mountain locale of Canmore, AB May 13 - 15, 2016. Invest Medicine Hat connects entrepreneurs and investors to business opportunities in Medicine Hat, Alberta, Canada. As business owners, they understand and anticipate the challenges in starting, expanding, or locating your business in Medicine Hat, Alberta. For New (or Prospective) Members - Welcome to the Sunrise Rotary Club! RAK Day 2015 - GoBeKind!